I’m pleased to introduce another interview, this time with a lady whose artistic coverings are an inspiration to me (more on that another time), and who blogs over at http://www.wrapunzel.wordpress.com. (One of the more clever blog names that I’ve come across.) I hope that you find her thoughts as interesting as I do. Please introduce yourself. What do you do with your days, hobbies, etc? Hi! I’m Andrea Grinberg. I am Canadian (born in Toronto) and Israeli (made aliyah) but currently live in Chicago while my husband is completing his degree. I started playing the cello when I was five and do so professionally, so I practice when I can! I do childcare in the morning, and every afternoon I work as the chamber strings director at a youth orchestra for inner city kids (called the YOURS Project). I also try keep up with my two sites (Harmony & Synergy and Wrapunzel), spend time learning, cooking, biking, and love be with my wonderful family and friends. In general, the communities that I associate myself with in terms of hair covering practice cover fully, with maybe a tefach showing at the front. There (of course) is debate about how much a tefach is – some say a handsbreadth, and others say two fingers. Personally, I cover all of my hair with scarves or hats. I do own a sheitel (wig) because it was recommended that I get one before I got married just in case I encounter a social situation where it is necessary, but so far that has not happened and I never wear it. I generally do not show any hair at the front, though sometimes I do so when wearing hats. Personally, I’m not completely comfortable with this and am considering whether or not I should do it at all. In my community, women cover their hair in public and when having guests to their house. However, many do feel comfortable showing their hair to immediate family members and female friends. I do not do this and only show my hair to my husband. I took on this extra stringency because my hair always got a lot of attention from others, and I want its beauty to be reserved for my marriage. How did you feel about covering your head, before you started covering? I was neither here nor there about it. I intellectually understood it and thought that women who covered with scarves were beautiful. I was never comfortable with the idea of wearing a wig on my head (esthetically and hashkafically) so knew that I would likely be wearing scarves most of the time. I had experimented a bit with what I already had, but nothing elaborate. I was looking forward to it mostly because I wanted to stop getting so much attention for my blonde hair. I never anticipated that I would love it so much! Honestly, before I got married, I did not know what the big deal was. Many of my friends had so much trouble grappling with the idea, and it was painful for them to start covering. Those who rejected it did so with a passionate hate that I simply could not understand. I also noticed that those who advocated for it did so with strength and conviction, but I never felt like they truly loved it. Because I grew up in a non-religious home, many mitzvot that I took on were very difficult and took years of study and introspection for me to reconcile with. Hair covering was not one of them. It made a lot of sense to me, and I was very “ho-hum” about it before getting married. First of all, I never expected how much my husband would love it! He is the only person that sees me with my hair both covered and uncovered, and he makes me feel beautiful each way. In private, my hair is something beautiful and intimate – just between us. In public, I feel like a queen – regal, dignified, loving, and a representative of the Torah. After getting married and realizing how much I love covering my hair, I found it even more shocking that the majority of women who cover do not embrace and enjoy it. Especially living outside of Israel, I have encountered so many women that are self conscious about it and don’t feel beautiful while doing so. Other women simply don’t know how. This is part of what made me decide to start sharing my love for it and help others embrace it as well. What was the adjustment period like? The day after our marriage, I almost forgot and walked out the door without putting on my scarf! The beginning was awkward; I knew nothing about scarf materials, grip bands, volumizers… nada! I got lots of “wow”s and compliments on my tichels in beginning, but this is probably more because of the smile on my face instead of what I wore on my head. The scarves kept slipping and I had to excuse myself to the bathroom to adjust. There was a big transition period leading towards my loving it, and it’s funny how it started; I started having nightmares about being outside without my hair covered and not being able to find a scarf anywhere. These nightmares were what made me realize that I was no longer “ho-hum” about covering my hair. Now, I cared about it. As soon as I realized this, the nightmares stopped. Has covering changed how you interact with the world (your husband, friends, family, strangers, God)? Covering my hair helps me be with my husband always, regardless of whether or not he is physically beside me. My head is a beacon of our commitment and love for reach other, and I feel like he is hugging my head everywhere I go. My non observant friends were mostly distressed about the idea of my covering my hair before I started doing so. For most of them, it was a relief to see how much I was still the same person afterward. (As I said before, my hair was always a big part of my identity.) I love showing them how to do it when they ask! My family has been very supportive and thank Gd, I think they are very proud of the things I have been doing with hair covering. In terms of strangers, I feel so much more public. I definitely stand out in the Jewish community of Chicago, because most people do not cover, do so partially, or do so with wigs. I feel that I can be a kiddush Hashem for scarf wearers, which is wonderful. It is definitely a conversation starter! I have talked many people on the bus and street just because of what I’m wearing on my head! 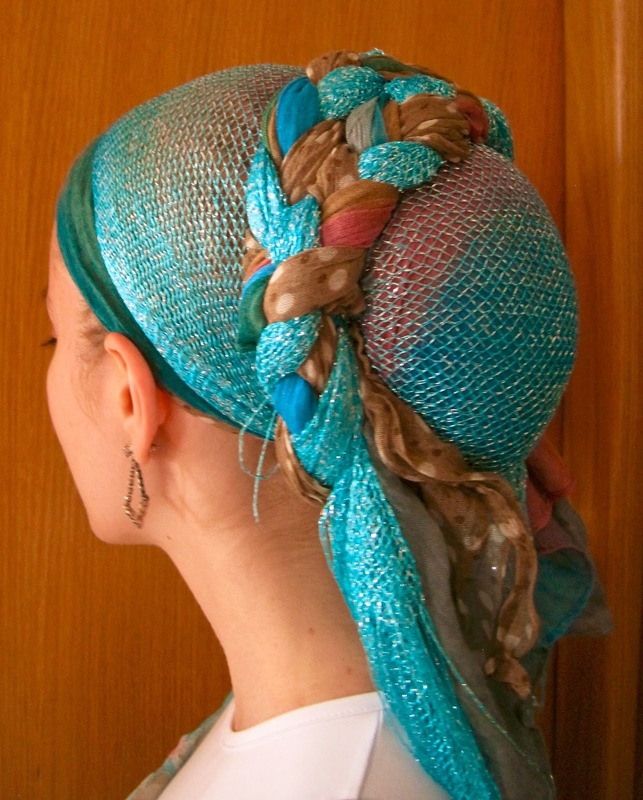 Would you share an inspiration that you get from covering your head? I feel so regal and womanly when I wrap my scarves beautifully. This is something that I never quite understood before and have never felt until I started covering my hair. What about a frustration or difficulty? It really saddens me how few women enjoy covering their hair. 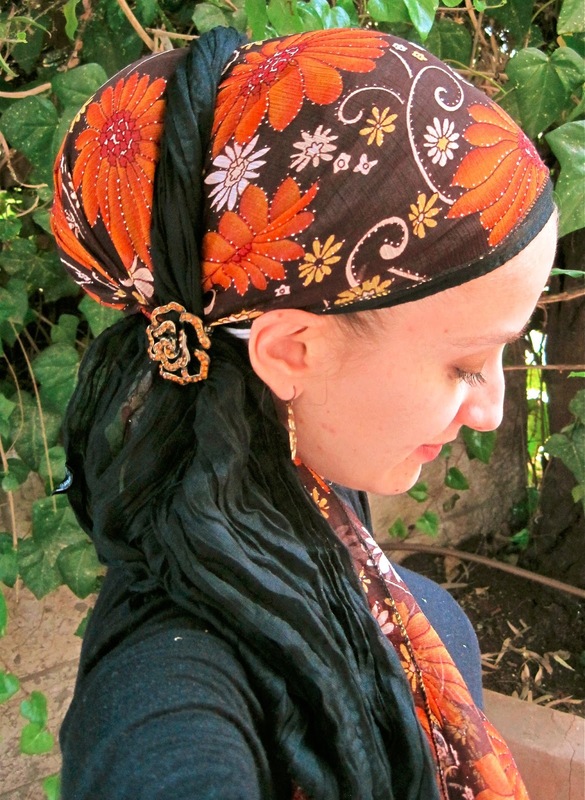 Sometimes I just want to leap out of my chair at a stranger’s Shabbat table and do a beautiful wrap on every woman’s head. Actually, the real issue is how few women understand and embrace their unique, deep and internal beauty and strength. I wish I could just give them a hug and help them see what the infinite sees. I really want to help every woman love and be loved, and shine from the inside out. You have a lovely blog with lots of covering styles and how-tos. How did that blog come to be? Putting my hair covering ideas online is a perfect example of how an incident can seem horrible and then turn into something beautiful. Since getting married, I had friends asking me to show them how to do wraps and some people did suggest that I do how-to videos. But I “didn’t have time” and there were “more important things” for me to do. Few people know this, but I had a health scare in Jan 2012. After realizing something was wrong and crying from fear, I instantly realized that I simply could not leave this life without contributing everything that I have learned and been given. This applied to other areas of my life as well, but surprisingly I realized that the thing that I wanted to share most was how to cover one’s hair beautifully. I made a commitment during that moment to start writing, teaching, and sharing. Thank Gd, I am healthy, and without that volatile time, I would have never gotten the coakh (strength) to share my story and run these sites. What tips or tricks would you like to share? Do NOT be shy! Ask questions and give compliments! Most women that cover would be happy to share where they find their coverings and how to do it! There are many practical tips and tricks on my blog, so I will just say this; Figure out what works for you and do not make assumptions about yourself. Find the colours that make you shine, but don’t be afraid to try something new and surprise yourself! Figure out the wraps and styles that suit your face shape best, but also make sure that you regularly experiment with something different. And always wear pretty earrings! How do feminism (whatever that means for you) and Orthodoxy interact in your covering practice? This is going to be a long answer. Thank you Maya for your wonderful questions that make me think so deeply! I had always known that I was put on this world with all my strengths and weaknesses in order to evolve as a human being and make the world a better place. When growing up, I applied this logic in order to decide what kind of career and general life I wanted. When I just turned twenty, I was living the academic and professional life that I thought maximized all my gifts in the fullest possible way. But there were two big gifts that I had overlooked. The first was the fact that I was Jewish. The second was that I was female. It’s funny in retrospect. I had factored in so many of my personal traits, my intellect, my musical abilities, my absolute pitch and odd hearing loss, my philosophical zeal, and need to be isolated with bursts of social inspiration, etc. But I had neglected to factor in my femininity and had already rejected Judaism. You can read a bit about my journey with Judaism here, but femininity and feminism is a different story; At the time, I almost felt that I was too “liberated” of a female to actually consider this part of myself when trying to become who I wanted to be. To make a long story short, I began to consider what being a female meant to me, and how I was going to include this in the life I wanted to build. I wanted my decisions to be about who I actually was, and not just be in reaction to men and what they do. I needed consider my desire and ability to bear children (bz”H), my sensual appeal, my binah (woman’s intuition), and my need to nurture and create in an expansive (instead of linear) way. What I started learning about Judaism and what it teaches about femininity, I immediately connected. I can say now that I do understand what it means to be a female (though I’m still learning! ), and am fulfilling my potential in a much greater way. Of course, hair covering is a huge part of this. 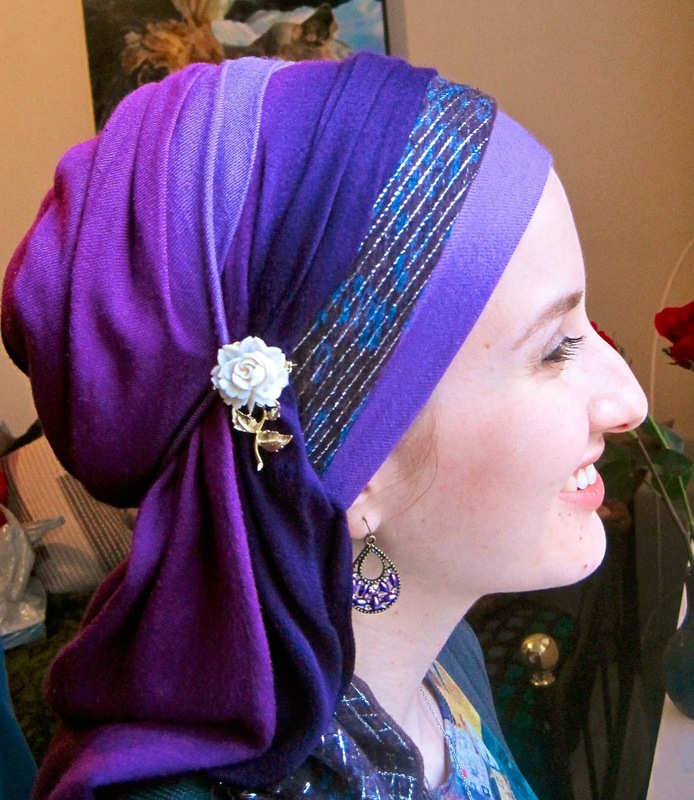 I love covering my hair – it’s my favourite mitzvah! I love how I feel like I am being crowned every time I wrap my scarves and that it is something so noticeable where I live. I feel like I can be a kiddush Hashem in a much greater way, because I am so noticeably a married, Jewish woman. Is there anything else you’d like to share, that I haven’t thought of asking? Maya, I don’t know you in person, but I want to say that I really appreciate you, your questions, and your blog. I am so glad that we are able to build some bridges between different sects of Judaism and that hair covering (of all things!) has helped us do this. Thank you for interviewing me and your awesome questions. The world needs more of this! You are an inspiration. Now that we’ve met you, would you share a couple of your favorite posts from your blog, that How To Cover readers might find beneficial?